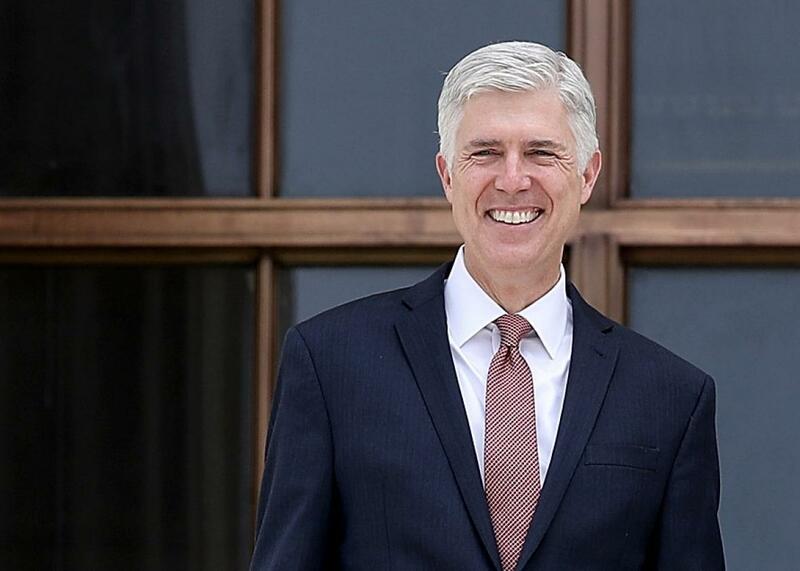 Neil Gorsuch is giving conservatives the chance to virtually destroy American unions. Supreme Court Justice Neil Gorsuch on the steps of the Supreme Court on June 15. On Thursday morning, the Supreme Court agreed to hear Janus v. American Federation, a case that could permanently hobble public-sector unions in the United States. There is little doubt how Janus will come down. In 2016, the court deadlocked 4–4 on a virtually identical case. At the time, Senate Republicans were holding Justice Antonin Scalia’s vacant seat open so that another conservative justice might be nominated should a Republican win the election. Now that President Donald Trump has put Justice Neil Gorsuch on the bench, he is almost certain to provide that fifth vote to deal the death blow to public sector unions, setting American back four decades. Janus involves a challenge to “fair share” fees—money collected by unions in order to negotiate a contract that applies to all employees, regardless of their union status. Unions can use member dues to engage in political activities as well as contract negotiations, but fair share fees only cover the cost of collective bargaining. In 1977, the Supreme Court ruled in Abood v. Detroit Board of Education that it is perfectly constitutional for public-sector unions to collect such fees from nonmembers. If nonmembers are exempted from fair share fees, after all, they become “free riders”—benefiting from the union’s negotiations without helping to fund them. Abood has been the law of the land for 40 years. Over the past half-decade, however, the Supreme Court’s conservatives, led by Justice Samuel Alito, have launched a campaign to overturn the decision. In the 2014 case Harris v. Quinn, the conservatives signaled that they were ready to kill Abood at the next opportunity, which would turn every state into a partial “right-to-work” state in one fell swoop. The next year, anti-union activists brought a case that would allow these justices to finish the job. But then Justice Antonin Scalia died and the court deadlocked 4–4, leaving Abood—and public-sector unions—to survive another day. We now know how this story will end. Senate Republicans held Scalia’s seat open for many reasons, but one had to have been the tantalizing opportunity to overturn Abood. When they confirmed Gorsuch, they essentially sealed unions’ fate. The justice’s ideology and jurisprudence strongly indicate that he will provide the fifth vote to kill Abood and kneecap public-sector unions. Republicans will get what they paid for. Why do the court’s conservatives think compulsory fare share fees are unconstitutional? The argument, in a nutshell, is that these fees constitute “compelled political speech,” because bargaining for a labor contract is allegedly a political activity. In this framing, nonunion members who refuse to pay fair share fees aren’t free riders; they’re victims of an ideological agenda who are being forced to violate their freedom of association. According to the court’s conservatives, the First Amendment should therefore prohibit public-sector unions from collecting such fees from nonunion workers—even as these workers enjoy the benefits that unions procure for them. One last point: Janus involves only public-sector unions, or unions composed of state employees. But there is no obvious reason why its logic should not apply to private-sector unions as well. In many states, when a majority of employees at a private company vote to unionize, the law allows for a contract that requires all employees in the bargaining unit to pay fair share fees as a condition of employment. But if these fees constitute compelled political speech, how can this contract be constitutionally enforced in court? The same First Amendment analysis would seem to apply to both public and private sector unions whenever the government forces anti-union employees to pay fair share fees. Thus, while Janus will be a crushing blow to unions, it probably won’t be the last one dealt by the Supreme Court. Once the court’s conservatives establish that fair share fees violate the First Amendment in the public-sector context, they can turn to private-sector unions and deploy a similar analysis. In doing so, they will turn every state in the country into a complete right-to-work state, constitutionalizing an issue that was previously the province of the legislature. Janus may well spur an irreversible decline in union power in American society. And for that, you can thank Neil Gorsuch.